A temple in northern Higashiyama with a history of imperial patronage as a monzeki temple, Shōren-in is located near the large temple Chion-in and Awata Shrine. Also known as the Awata Palace, Shōren-in was once used as a temporary imperial palace after fire ravaged the original, and it’s atmosphere has been compared to the stateliness of an imperial residence. 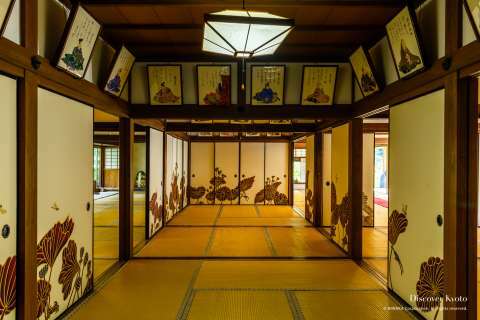 Greeting visitors with giant camphor trees nearly a thousand years old, Shōren-in features several halls filled with gorgeous screen paintings both traditional and modern as well as a lovely strolling garden containing a small pond and vibrant azaleas. 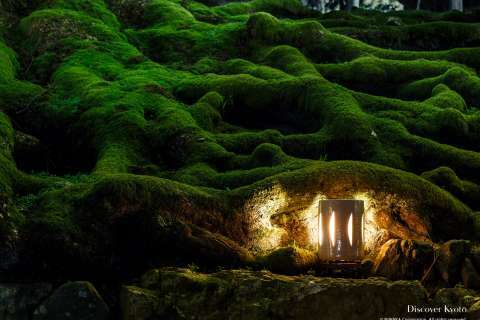 Green tea can be enjoyed while observing the garden from within, and special light-ups twice a year offer a chance to see the temple illuminated beautifully after dark. 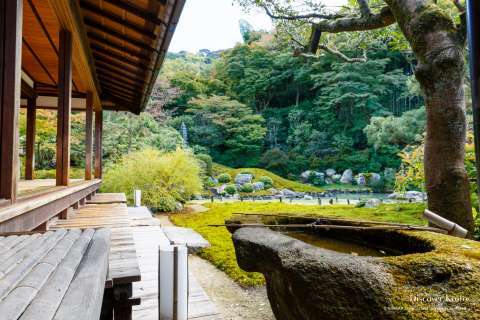 Shōren-in features several halls filled with gorgeous screen paintings both traditional and modern as well as a lovely strolling garden containing a small pond and vibrant azaleas. 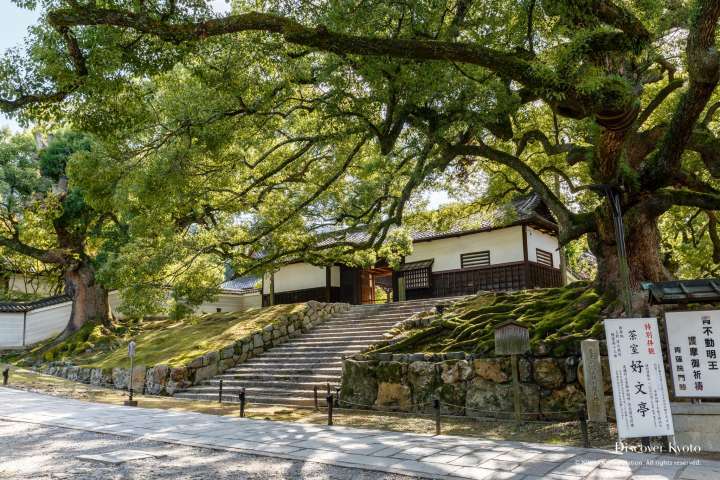 The first thing you’ll be greeted by when arriving at Shōren-in are a pair of giant camphor trees (kusunoki). The trees at this temple are famous for their great age and size, branches spreading overhead thanks to their eight centuries of growth. It’s said that the camphor trees were planted by Saint Shinran (1173 – 1263), a Buddhist monk originally ordained at Shōren-in and later founder of the Pure Land School of Buddhism. The first main building to be visited is the Kachō-den, which offers an impressively beautiful view of the garden surrounding the hall. 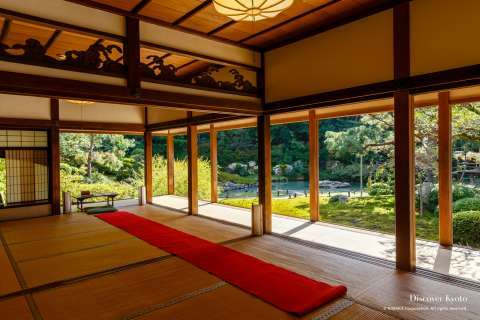 Visitors who pay a fee can sit and enjoy green tea and a sweet while they take in the sights, or wander through the rooms featuring portraits of poets, photographs from visits to the temple by the Japanese imperial family, and traditional-modern art on the sliding screens done by paint muralist Ki-yan. With a pond garden designed by the famous landscape artist Sōami (d. 1525) and a strolling garden designed by aristocrat artist Kobori Enshu (1579 – 1647), the garden wraps around the Kachō-den Hall and proceeds in a meandering path up into the foothills towards a small shrine offering a view of the temple from above. The pond viewable from the hall is known as the Ryujin no Ike, or “Pond of the Dragon God”, placed before a small hill on which sits a brilliant azalea bushes and a stone pagoda. Following the path through the garden takes one past a large cluster of the vibrant red spring flowers and past the Kobun-tei teahouse to the Hiyoshi Shrine and its elevated view of the grounds, then back down past the other temple buildings to the exit. The hall of the temple where Buddhist services are held, the Shin-den Hall possesses an architectural style more commonly seen in palace living quarters than temples, with rooms partitioned by delicate reed screens that hang at the ready to be taken down and hide occupants from view. In the center room one finds the main altar, flanked on the right with wooden statues of saints. To the left is a corridor that features peacocks painted on wood and a room displaying treasures of the temple bearing the imperial seal in a room whose screens are decorated with cranes. In front of the hall is planted a tachibana citrus tree and a sakura tree, in accordance with the building’s status as a hall of state transferred from the imperial palace. Shōren-in is a temple that regularly holds light-up events twice a year. The first coincides with the Higashiyama Hanatōro event and then cherry blossom season, and the other with the autumn leaf viewing season. The temple garden view from the Kachō-den is lovely, and so is the view from the top of the garden foothills looking down on the temple buildings, but the real joy can be found in front of the Shin-den Hall, where hundreds of tiny blue lights twinkle in the grass and make it appear as if the ground has become a starry night sky, with a bright beacon of light shooting towards heaven behind it. Shōren-in’s history began with a shukubo (priest’s quarters) called Shōren-bo attached to Enryaku-ji Temple on Mt. Hiei during the leadership of its founder Saichō (posthumously known as Dengyō Daishi). Retired Emperor Toba (1103 – 1156), a devout follower of the Tendai school, asked the Shōren-bo monk Gyogen to instruct his seventh son, Kakukai Shinnō. In order to facilitate the prince’s studies, Retired Emperor Toba constructed a residence he then named Shōren-in. Shōren-in served the priests when they visited the capital, and when they studied at Mt. Hiei they resided at Shōren-bo. Prince Kakukai inherited leadership of this temple from Gyogen as its second head priest, and so Shōren-in received the title monzeki and came to also be called the Awata Palace. Head priests were appointed from the imperial lineage all the way until the Meiji Era when the practice was ended. The third head priest, Jien, was a noted historian and poet as well as the leader of the Tendai sect for some time, which ushered in a golden age for Shōren-in. Working with the respect of the imperial family, he was the author of the seven volume Gukanshō, (“Jottings of a Fool”), in which he compiled a chronicle of imperial Japanese history and discussed the state of the era under the belief that it was currently the Buddhist age of mappō, a time in which it was thought Buddhist virtues were in decline and people would no longer be able to obtain enlightenment simply through words- that a new Buddha would need be reincarnated to guide the lost back to the doctrine. Jien’s skills at poetry allowed him to be named one of the “new” thirty-six immortals of poetry, with his poems included in several important compilations of poetry at the time. Like the cherry blossom, the heart planning on tomorrow is ephemeral indeed --what sudden storm may not arise in the middle of the night? Like most of Kyoto, Shōren-in suffered damage during the Ōnin War (1467-1477), and was later cut down in size by the Tokugawa shogunate, who used the land to found the nearby Chion-in Temple. Dowager Empress Tofukumon-in had a Shishin-den, a Hall of State, donated to the temple, which is now Shōren-in’s Shin-den. After the Great Fire of 1788 destroyed the imperial palace grounds, Retired Emperor Go-Sakuramachi resided temporarily at Shōren-in, which led to the temple acquiring the title of the Awata Palace, being situated at the foot of Mt. Awata. Even today, Shōren-in has a reputation for closeness to the imperial family, and photographs of the current emperor and empress’ visit can be seen in the Kachō-den.